These Pumpkin Salted Caramels are chewy, decadent and easy to make with pantry staples. Get your thermometer and silicon baking tray to hand. Add all the ingredients (minus the salt) into a saucepan over low heat and cook away stirring frequently until the butter is melted and the sugar has dissolved. Then increase the temperature to medium high and bring the mixture to the boil. Let it boil without stirring so it transforms into caramels. Keep checking the temperature of the caramel and as soon as it has got to 122C, switch off the heat and pour the caramel into the silicon tray. Gently tap the sides of the tray so that you remove any air bubbles and sprinkle on the salt flakes. Let cool fully (preferable overnight) before cutting and serving. 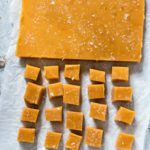 These pumpkin salted caramels will keep best if you wrap individual portion in non-stick paper. Cutting. If you find it hard to cut these straight out of the fridge, then let them stand for about 5 mins before cutting. Thickness. For thicker salted caramels use a smaller baking tray and for thinner ones use a larger tray. Best to keep them in the fridge till you need them. Storage. These pumpkin salted caramels will keep best if you wrap individual portion in non-stick paper. Assemble everything. Make sure you have everything to hand before you start cooking. It is easy to overcook the salted caramels so you want to have everything you need right when you need it. Use double cream. Double or heavy cream has the right amount of fat content to make these salted caramels. Prevent crystallisation. There are a few ways to prevent crystallisation which can happen when sugar crystals form on the side of the pot whilst cooking. One way is to cover the pot for a min or two when you have brought the mixture to boil so that the steam washing the sugar down the side of the pot back into the caramel and then open the pot again. The other way is to use a silicon brush dipped in water to brush the sides of the pan. Clean up quickly. I find it easier to clean the thermometer as soon as I have finished. I simply wipe it with a wet cloth straightaway and store it away.